I don't know why Atrios calls her a racist, but I have mine. Howie Kurtz says "The liberal blogger Atrios (Duncan Black) called Malkin a racist over her views on immigration and said anyone who promotes her site 'may as well be promoting the Klan." I doubt I've ever called Malkin a racist over her views on immigration, unless she was appealing to or invoking racism when addressing the subject. People can have a tremendous range of views on the subject of immigration without racism having anything do with it. 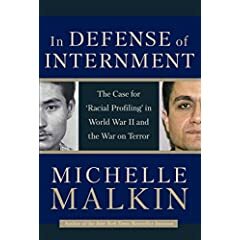 Just so we all understand, in the year 2004 Michelle published a book justifying an act that Ronald Reagan apologized for - the mass arrest of Japanese immigrants and Japanese-American citizens of America based on nothing other than their ethnic background. Anyone who links to her or promotes her in anyway may as well be promoting the Klan or Stormfront.org. That includes you Chris Matthews. The publication of that book, which she did to appeal to the Little Green Snotball brigade, will be a stain on her soul for all eternity. I intend to remind the world of it at every opportunity. The combat history of the 442nd mitigates any and all aspects of her poorly written and researched book. The 100th landed at Oran in Algeria on September 2, 1943, and was originally scheduled to guard supply trains in North Africa. However, Colonel Farrant L. Turner insisted that the 100th be given a combat mission, and it was attached to the "Red Bull" U.S. 34th Division. The 100th sailed from North Africa with 1,300 men on September 22, 1943 and landed at Salerno on September 26, 1943. After obtaining its initial objective of Monte Milleto, the 100th joined the assault on Monte Cassino. The 100th fought valiantly, suffering many casualties; by February 1944, it could muster only 521 men. The depleted battalion joined the defense of the beachhead at Anzio until May 1944, and then added momentum to the push for Rome, but was halted only 10 miles from the city. Some believe that the 100th was deliberately halted to allow non-Nisei soldiers to liberate Rome. The 442nd (other than the 1st battalion, much of which had already been sent as replacements for the 100th, and the remainder of which remained in the U.S. to train further replacements) landed at Anzio and joined the 100th Battalion in Civitavecchia north of Rome on June 10, 1944. The 100th Battalion was now officially part of the 442nd Regimental Combat Team, but was allowed to keep its unit designation in recognition of its distinguished fighting record. The combined unit continued in the push up Italy, before joining the invasion of southern France, where the 442nd participated in the fight to liberate Bruyeres in south France, and famously rescued the "Lost Battalion" at Biffontaine. Pursuant to army tradition of never leaving soldiers behind, over a five-day period, from 26 October to 30 October 1944, the 442nd suffered over 800 casualties—nearly half of its roster—while rescuing 211 members of the 1st Battalion, 141st Infantry (U.S. 36th Infantry Division, originally Texas National Guard), which had been surrounded by German forces in the Vosges mountains since 24 October. The 522nd Field Artillery Battalion remained in France, and joined the push into Germany in late 1944 and 1945. Scouts from the 522nd were among the first Allied troops to release prisoners from the Dachau concentration camp. The remainder of the 442nd returned to Italy to continue the fight against the Gothic Line established by German Field Marshal Kesselring in the Apennines. The 442nd is commonly reported to have suffered a casualty rate of 314 percent (i.e. on average, each man was injured more than three times), informally derived from 9,486 purple hearts divided by some 3,000 original in-theater personnel. U.S. Army battle reports show the official casualty rate, combining KIA (killed) with MIA (missing) and WIA (wounded and removed from action) totals, is 93%, still uncommonly high. The purple heart figure, though representing a broader range of wounds including those which may not have removed a soldier from action, is disputed by some researchers. A good amount of these Purple Hearts have been awarded during the campaign in the Vosges Mountains. Some wounded were soldiers who were victims of trenchfoot. But many victims of trenchfoot were forced by superiors, or willingly chose, to return to the front even though they were classified as WIA.